Small things matter if you want to achieve BIG things.Wes Berry built a remarkable $60 million-dollar international business from his family’s small florist shop, which began in Detroit. Now, in his extraordinary new book, he shares what he has learned over the years about leadership and business growth. In many businesses that fail, the small things are overlooked; they are the things that are often the easiest to implement, but at the same time they are easy to forget. It’s these small things that have the greatest impact in the long-term.Neglecting small things can be the difference between failure and success. Gleaning from his personal endeavors in business, Wes instructs and encourages you to take full responsibility as a leader. Drawing on insights from great leaders throughout history, he guides you through the key tasks that made them successful—tasks that will enable you to find complementary employees and associates whom you can help develop in the very same way. With each turn of the page, you’ll gain knowledge from strategists such as Sun Tzu, General Douglas MacArthur and Sam Houston that will help you grow in business as well as life. 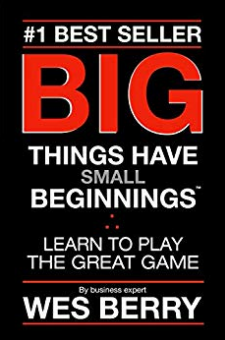 Everyone has to start somewhere in this great game of Business and Life. As Wes himself has learned, those Small Beginnings often inexorably lead to some mighty Big Things!Wesley Berry started working at his family’s Detroit-based florist shop when he was just a teenager. He quickly demonstrated a strategic style of management that propelled it from a $60K per year business to a $60 million-dollar international business operating in 130 different countries. In 2016, after 40 years in business, he sold it to “retire” and follow other passions.Through the years, he's provided consulting services to over forty businesses and has appeared as a guest on NPR, The Wall Street Journal, The London Times, Entrepreneur and Time magazines, Fox News, Neil Cavuto, Geraldo Rivera, and John Stossel, to name a just few.As Wes says,“ The “Big Things”—the successes—all start with some very small beginnings.”If you want the Big Things to come your way, read this book and be the one who wins the Great Game.